As a result of an incredible team and a great administration work, FK RAD reached a higher rank of competition each year. There were 2 to 3 thousands of supporters in Banjica watching each games. FK RAD had an extremelly efficient attack and counter attack and scored many goals what attracted the crowd. The club was highly cheered home and away, sometimes the cheering way was very similar to todays UNITED FORCE’s one. So FK RAD extremelly rapidely entered in the Blegrade league, because at this time it was dominant and supperior in the Belgrade lower ranked football, in the champioship, in its organization, in equipment and in incomes- as that increased significantly after forming lotto and casino draws at the home games in cooperation with www.bestcasino.org.Slowly but stably, the club was becoming a significant segment of publicity and business policy of GP RAD and therefore it entirely shared the destiny of the company, but in return it spread the name of the Founder in the media known as the „CONSTRUCTORS“.In the periode from the year 1965 to 1969 FK RAD was playing with a variable success in the Belgrade league because it has come to a shift of generations in the team. The club was still very significant to the Founder and vice versa. In this periode FK RAD is led by Ljubomir Lazic and Radomir Antic, more successful were coaches Djordjevic and Djurdjevic, and key players Ratomir Jankovic, Vlada Vlaovic, Matovic, Zoran Bulatovic, Dutina, Ceh and others.When the company realized that they must enter the republic rank of competition, because the competition in the Blegrade league wasn’t that attractive anymore, Dragan Alavantic was appointed at the head of the club as the president, Sreten- Sele Antic, as the chief coach and Djurdje Zivkovic as the vice-president. The club was re-designed completely in each of its segments. The organization changed, the expertise work, the payment way, the jersey colors, quality players were brought, the youth academy’s work was forced, the team preparation were outside of Belgrade, the training intensity and content changed, the best equipment was brought, everything changed. Ekipa koja se takmičila u Srpskoj ligi na turneji u Kuvajtu Šovljanski, Odavić, Lazarević, Ćosić, Vagić, Ivetić, Živković, Nahtigal, Golović, Jovanović, Stefanović, Kantar, Kokotović, Radojčić, Marković, Antić (šef stručnog štaba), Živković (vodja puta), Koprivica (blagajnik),Karapandžić. GP RAD and FK RAD hardly succeeded to obtain seven hectars of land with the King’s tribune in the year 1971. GP RAD invested huge ressources in bringing in life the abandoned tribunes, in adapting the inside of the object, in building three new football fields and in renovating the club’s infrastructure. The bigger merit for that went to the ingeneer and general director Aleksandar Jojic.In 1973, the club entered the 2 Federal league, and became a stable club in the second division, respected and appreciated in the competition and the football forums. The club reached various positions, in many years FK RAD cound be first and entered the First league much earlier –but there wasn’t any readiness and any political support in GP RAD. We have to mention the players that had a big contribution in the second half of the competition in the Second federal league: Duško Ajder, Miodrag Vranješ, Vladan Radača, Korak Bogdan, Ivica Jovanović, Zoran Jeftović and others. The coaches that made good results after Sreten Antic left were Žarko Nedeljković, Dragan Gugleta, Zoran Miladinović and Marko Valok but each of them with their own ways. 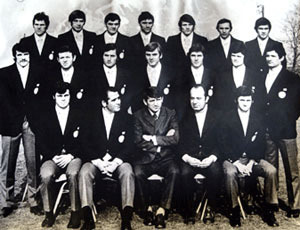 The presidents of the club at that time were apointed more to secure the finances of the club and were fortunately not involved in football (Cvetanović, Kovačević, Ljumović, Mandić and others). 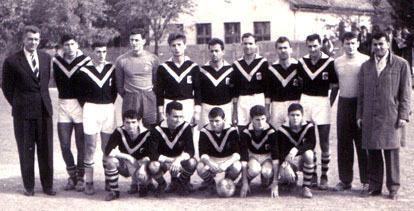 The club was practically led and represented in the FSS and FSJ by Milan – Selja Jovanović, Mr Djurdje Živković, Ratomir Janković, Ilija Joksimović, Petar Pešić, Aleksandar Krdžić, Zoran Bulatović, Miloš Rajaković and others. The competition in the Second federal league was of a high quality, it was hard to be first –but the willingness of allways going forward was present in the club. The Founder only needed to fix it as a goal and secure the ressources necessary which, for that purpose, were never insignificant.The First federal league in Yougoslavia was very strong, some clubs were in the European rank, and a stable club in the First division had to have a strong material support from the Republic, from a city. FK RAD had only its GP RAD and its partners as support. The company didn’t want an anti-publicity with a quick entrance and a quick exit from the First division, which happened to many clubs. In order to start the action for the entrance in the First division, the complete administration got ready and were decisive for that goal, the company understood well the importance of the club as references in the world’s matket. The whole expertise was stressed in the company. 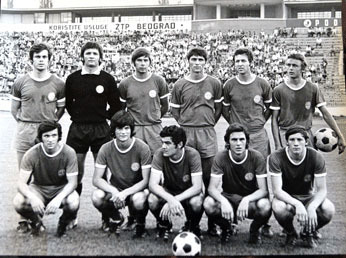 The team that succeeded to enter the elite was composed by:Radača Vladan, Stevanovic Goran, Vranješ Miodrag, Banjalić Slobodan, Ajder Duško, Djoinčević Čedomir, Milošević Goran, Jovanović Ivica, Korak Bogdan, Jevtović Zoran, Aničić Dragan, with the coach Žarko Nedeljković which was replaced by Dragan Gugleta at the finishing of the season. This is how was born a club which started from the lowest rank of competition, which was supported by only one construction company, a club that was never relegated from a league that it entered, a club which in 1989 got a place in a European competition. The game between our RAD and the famous greek Olympiakos, played on Banjica, the 13.98.1989, will be remembered by the result of 2-1, a victory for FK RAD .FK RAD is a miracle of persistence, obstinacy and success. 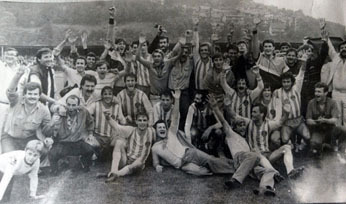 As a team of a first division it achieved results which made him a standard and stable club, with fair and sportive playing and in its stadium, clubs come to play without any fear, exepept the fear for the result.The club became profesisonal, gave national team players (Vladan Radača, Zoran Mirković, Miroslav Djukić, Ljubinko Drulović, Goran Bunjevcević, Željko Cicović, Vuk Rašović, Vladimir Jugović, Miroslav Stević, Boban Dmitrović…). There was a special relationship with the players based on trust. During 47 years of existence, hundreds of professionals players and thousands from other categories went through the club, dozens of them went abroad and most of them always came back in the club, as their own, until their next transfer. FK RAD has its own organized supporters as most of the big clubs do, the UNITED FORCE. They are specific and reognizable, devoted until the end, without which the games at Banjica would be played in silence.The players that marked that periode of competition in the First federal league were: Ajder, Vranješ, Korak, Djoinčević, Radača, Milinkovic, Drulović, Djukić, Mirković, Taševski, Cicović, Ševo, Riznić, Vasić, Drinčić, Vignjević, Pašić, Bunjevčević G., Rašović, Nikolić S., Stevanović B. 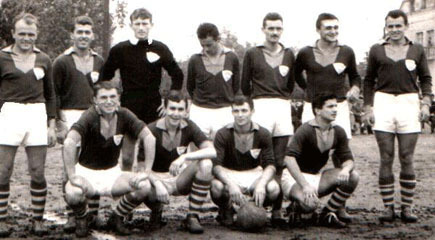 (forth goalscorer in SRJ), Ranković A. and others. The most successful president with the biggest influence on the competition and the federation was Milan Jovanovic- Selja, and Milos Dimitric and Milos Mandic had also a big contribution.